Describe the difference between Classic apps and Lightning apps. Access and switch between Lightning apps. Tell whether a Classic app is accessible in Lightning Experience. An app is a collection of items that work together to serve a particular function. 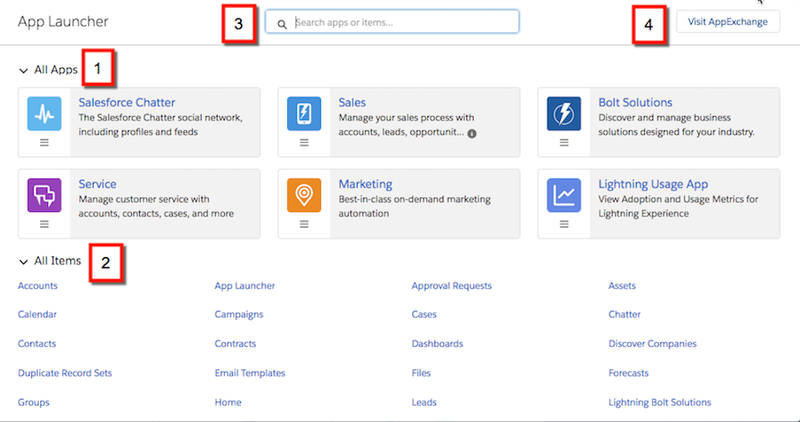 Salesforce apps come in two flavors: Classic apps and Lightning apps. Classic apps are created and managed in Salesforce Classic. Lightning apps are created and managed in Lightning Experience. You can customize both types of app to match the way your users work. With apps in Lightning Experience, members of your org can work more efficiently by easily switching between apps. Users can open apps you’ve created from the App Launcher. What’s most important to sales reps? Accounts, events, and organizations. How about sales managers? Reports and dashboards make the top of the list. 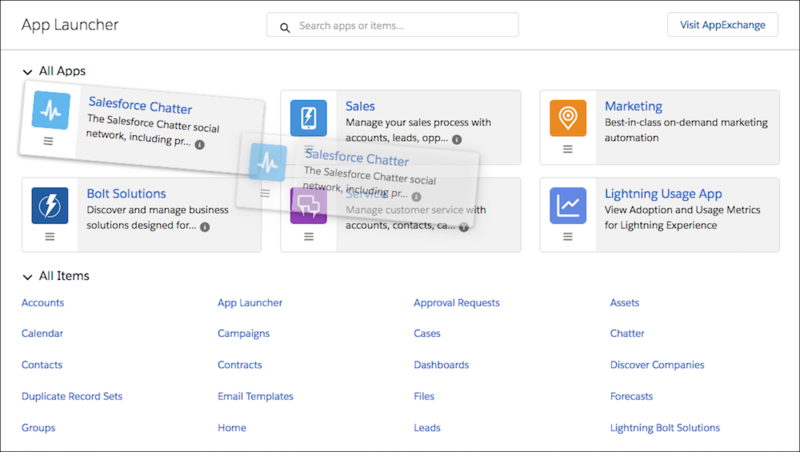 If you know Salesforce Classic, the Lightning Experience navigation model will feel like a familiar friend, only better. The items in an app are always just one click away in the navigation bar. What can you put in the Lightning app navigation bar? Lightning apps can contain everything on this list plus Lightning page tabs and utilities like Lightning Voice. If your org uses utility features, you can enable a utility bar in your app that allows instant access to productivity tools, like integrated voice, in the Lightning Experience footer. How can users personalize the navigation bar? 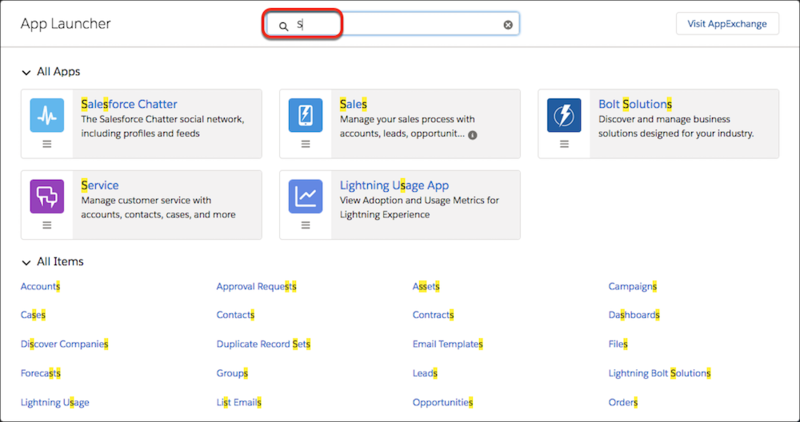 Personalized navigation in Lightning Experience is similar to customized tab sets in Salesforce Classic but better. In Lightning Experience, the navigation bar can contain more than just object-level items, like Accounts. You can add granular items, like a dashboard, list, or record. Let’s look at the different ways users edit the navigation bar. You can drag items on the navigation bar to change their order. The asterisk to the left of the item name indicates that it’s a temporary tab. A temporary tab opens when you open an item that doesn’t have a parent object already in the navigation bar. 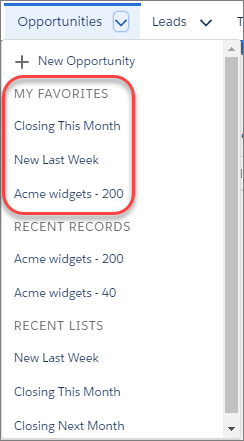 The temporary tab is removed from the nav bar when you close it, log out of Salesforce, or switch to a different app. Reorder the items already in your navigation bar. Add items to the navigation bar. Click Add More Items. Search through your favorites or all available items in your org, and choose what to add. After you make your selections, you can reorder or remove items before saving your changes. You can’t delete items that your admin has specified for the app. Help users get the most out of personalized navigation by upgrading your Classic apps to Lightning apps. Users can’t personalize the navigation bar of Classic apps in Lightning Experience. Check what’s in your apps. Users can’t remove the items you include in the navigation bar, and they can’t personalize the navigation bar when it contains more than 50 items. For example, if you include 32 items in an app’s navigation bar, users can add 18 more personal items. Items that you add to an app’s navigation bar are added to the end of users’ personalized navigation bars in the order that you added them. When you remove an item from an app, that item remains in your users’ personalized navigation bars, and users can then delete it. If you don’t want your users to personalize the navigation bar for a specific app, disable personalization. From Setup in Lightning Experience, go to the App Manager. For the desired app, select App Options. Select Disable end user personalization of nav items in this app. If you don’t want your users to personalize the navigation bar for any app, disable personalization. From Setup, enter User Interface in the Quick Find box, then select User Interface. Select Disable Navigation Bar Personalization in Lightning Experience. Salesforce recommends disabling navigation personalization by app instead of for the entire org. Control if temporary tabs are created when users access items outside of the app. From Setup in Lightning Experience, go to the App Manager. Edit the desired app. On the App Options page, select Disable temporary tabs for items outside of this app. Favorites are another great way for your users to boost productivity by personalizing how they navigate. Think of the favorites star at the top of the page in Lightning Experience as a constellation in the sky. It’s always there, so your users can easily navigate to what they need no matter where they are. Click the favorites star to add the current page—for example, opportunities closing this month—to your favorites. Saved favorites are always just a click away in the favorites list. A highlighted star means you’re on a favorite page. To remove a favorite, click the highlighted star. 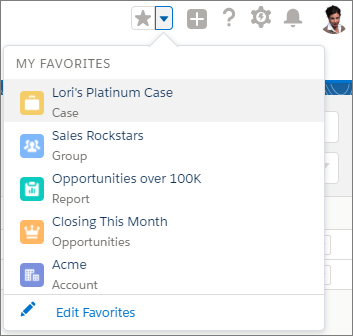 Your users can easily personalize their favorites lists by renaming favorites and rearranging items in the list. If an item in the navigation bar has a dropdown menu, it automatically includes the user’s top favorites for the item. With the App Launcher, your users can switch between apps and access available items and features. The App Launcher is so central to navigating Lightning Experience and its apps, we’ve positioned it within easy reach on the left side of the navigation bar. It’s available from any page. The App Launcher displays all available apps in one place so your users can easily find what they’re looking for—even apps they didn’t know they had. Apps show up in the App Launcher as large tiles under All Apps (1). Other items, such as custom objects, tasks, events, and the feed, show up under All Items (2). Don’t see what you want? Search for it by name in the search box (3). Expand your search to find the latest cloud-computing apps and services available on the AppExchange (4). You can do it all with the click of a button without ever leaving Lightning Experience. As an admin, you can change which apps appear on the App Launcher and the default order in which they appear. You and your users can then drag the tiles around to create your own personal view of the App Launcher. Your users see only the apps you authorize for them to access through profiles or permission sets. The App Launcher’s great for finding an app or item even when it’s not currently on the navigation bar. Just click the App Launcher icon ( ) to search for it by name. For example, say you’re looking for an item called Service. Enter Service in the search box to see items and apps that match your search as you type. The App Manager in Setup is your go-to place for managing apps for Lightning Experience. It shows all your connected apps and Salesforce apps, both Classic and Lightning. What does that “Visible in Lightning Experience” column mean? A checkmark in the Visible in Lightning Experience column means that the app is accessible in Lightning Experience via the App Launcher and is fully functional. You can toggle the availability of your Classic apps in Lightning Experience by selecting or deselecting Show in Lightning Experience on the Classic app’s detail page. Classic apps that have been upgraded to Lightning apps automatically have that setting disabled. We’ve mentioned a couple of times now that you can upgrade your Classic apps. Why do that? So your apps can take advantage of all the perks of Lightning apps. We’ll get there shortly. But first, let’s get your org ready for it. We want to walk you through upgrading a Classic app to Lightning. To do that, you need to have a clean custom Classic app in your org. So we’re going to enlist an old friend for help: the enhanced Warehouse data model. You might be familiar with the Warehouse app if you’ve gone through the tutorials in the Lightning Platform Workbook . We took the Warehouse data from that guide and added a few extra things to it. If you’ve gone through the exercises in the Salesforce Mobile App Developer Guide , you probably already have the enhanced Warehouse app installed. Check your Developer org. If you already have the Warehouse app installed, skip these steps. Go to www.salesforce.com and log in to Salesforce using your Developer Edition credentials. Open a new browser tab or window, and navigate to https://github.com/forcedotcom/Salesforce1-Dev-Guide-Setup-Package. Do this in the browser that you logged in to your Developer org with. Click the link in the README file. This is the installation link for the enhanced Warehouse data package. You should be taken directly to the Package Installation Details page. Wait for the installation to finish, then click Done. If your DE org is set to Lightning Experience, switch to Salesforce Classic. From the app menu, select Warehouse. Click your name in the upper-right corner, then select Switch to Lightning Experience.